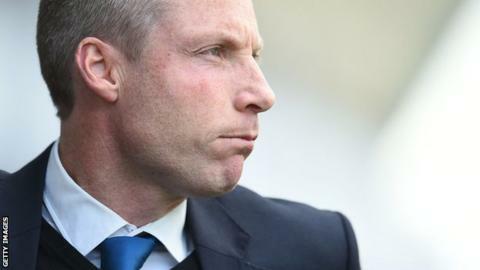 Millwall manager Neil Harris is considering entering the loan market after midfielders Jimmy Abdou and Ed Upson picked up injuries. Both went off during Saturday's loss at Peterborough - Abdou with a shoulder problem and Upson with a knee injury. "With injuries to two key midfield players we are looking at the possibility of strengthening the squad," Harris told the club website. Millwall are 15th in League One after four wins from their first 11 games. The Lions face Northampton Town in the Johnstone's Paint Trophy on Tuesday, but their next league match is not until 17 October against Swindon. "After the game against Northampton we have a big 11-day break to assess where we are and reflect on the first chunk of games this season," Harris added. "It gives us a chance to look at who has impressed, who hasn't, and evaluate what areas could do with strengthening."